Introducing the newest members of our team! 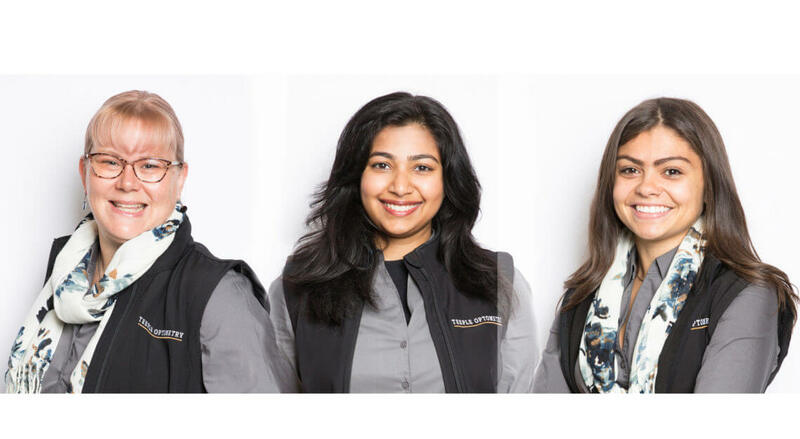 We would like to introduce you to the three newest members of the Teeple Optometry team! Karen has taken on the role of managing our onsite finishing lab as an optometric lab technician. She will ensure that your custom eyewear is edged and assembled accurately, efficiently and with aesthetic precision. You may also see her assisting with eyewear selection and fittings in our gallery. Radika has stepped into the role of optometric assistant. Her previous extensive medical training has equipped her to work as an assistant to the doctors. Her thoughtful approach will help you choose comfortable and fashionable eyewear while managing expectations and adaptation. Alex is the newest team member working primarily in the frame gallery. Choosing eyewear can seem like a daunting task but Alex is more than able to help you choose eyewear that matches your style in a relaxed manner while respecting your preferences. We’re very proud of our entire team and hope you are able to meet Karen, Radika and Alex at your next visit.